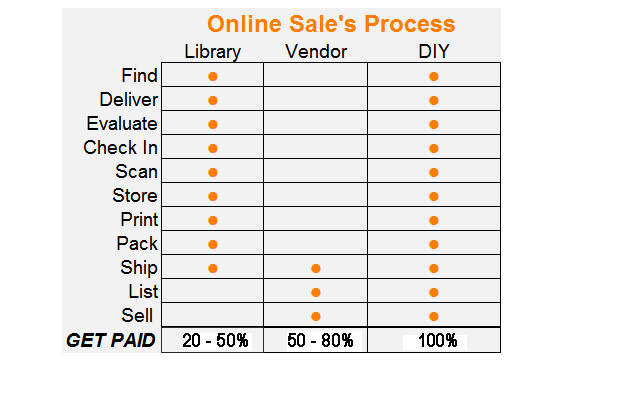 The 21st Century brought has brought the potential of Online Selling to the local library. Millions of people can now browse your local inventory Online! Currently individual seller's walk into your library, purchase Books, CD's, DVD's etc and sell them online for substantial profits. Isn't it about time your library took advantage of all of its available resources? Whether you have a shelf or a store, every library has a way that it sells its donations. Many of you have embraced outside vendors to handle this for you. You already collect them, simply review them, scan them, fill a box, and ship them out! Then wait 14 days for the money to start coming in! It is that simple. Neatoscan believes that its NEVER ok to pay someone else money for money that is already yours! With budgets being slashed, needs increasing, isn't it time you keep as much of your money as you can and put it to use where it is needed? You're already doing the work, so why aren't you getting paid?